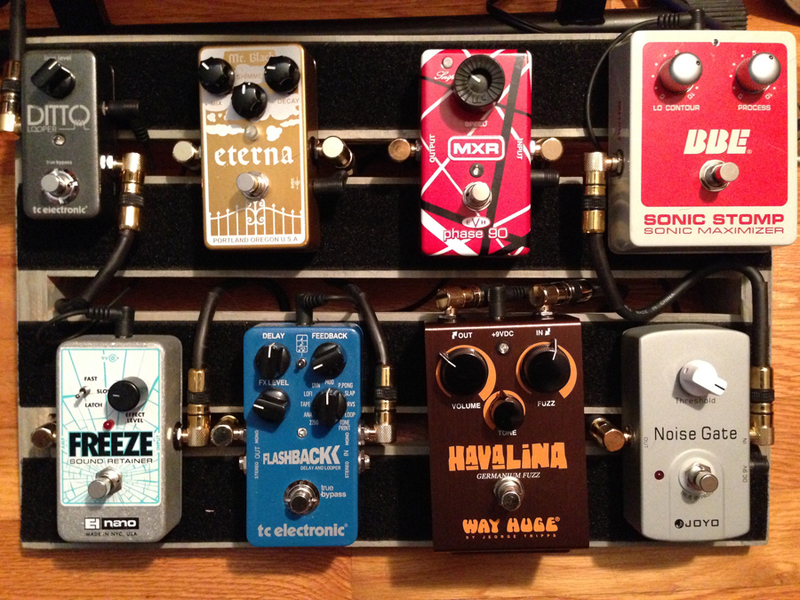 Today’s pedal line is from Donna King. If you have a pedal line (doesn’t have to be in a board) for your rig, please email me a photo, bio, description of pedals and routing to pedalline@nulleffectsbay.com. Every Friday I’ll showcase a pedal line submission. Make sure you include any links to your band or music page. I find after some experimentation that this is the most effective and best sounding means to run these pedals for me. The reason I like my effects pedals are: The BBE sonic stop just makes everything sound better! It seems that no one can really say why this is but honestly the sonic stop just improves note clarity, and definition of whatever I play. 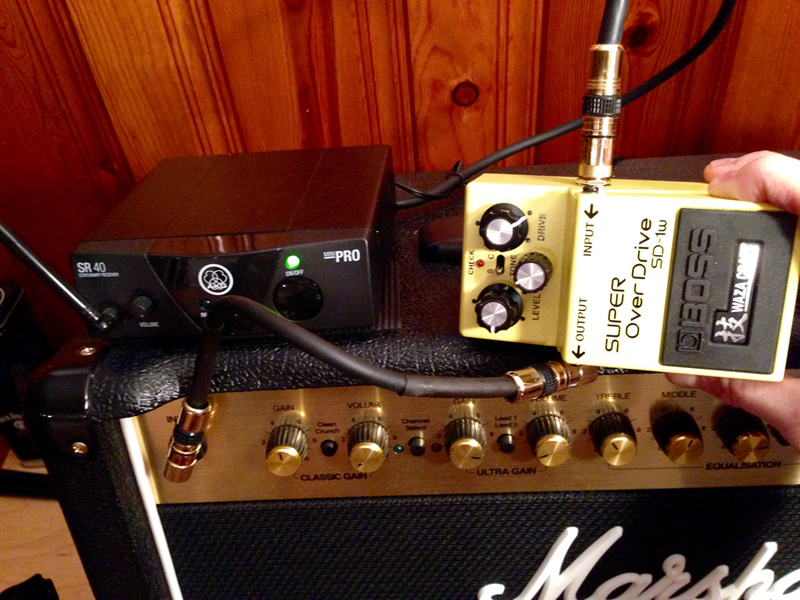 The Joyo noise gate stops any amp hum when I use the high gain channel on my amp. The Havelina fuzz is the best sounding, creamiest fuzz I have ever heard. It’s not Buzzy like some. The MXR eVh phase 90 is just a beautiful sweeping but controllable phaser that plays nice with other pedals! Mr. Black’s Eterna Gold reverb pedal is simply amazing! The shimmer knob lets you dial in some crazy-good “choir from the Heavens” effect which is quite mesmerizing & beautiful when I play through my amp’s clean channel. The TC electronic flashback delay has every kind of delay sound that anyone could want. I prefer the tape delay or mod delay setting. The electro harmonic’s Freeze nano is perfect when I want to freeze a note or chord I’ve just played and hold it and definitely while I play lead over that held chord or note! It gets me creative really quickly! The TC electronic ditto looper is an easy to use looping pedal that does what it’s supposed to very simply. Loop! *For powering my pedal board I use a Modtone Power Plant power supply that is mounted under by board with velcro. All of my cables are South Creek Audio brand, oxygen-free copper, shielded cables. In my experience these are of the highest quality and are very reasonably priced and ruggedly made! I see three pedals that I want so badly. Saving my pennies for the Freeze pedal and the BBE Sonic Stomp pedal. Still on the fence about MXR VH version phase 90. Will try one out. Great post!